Don't miss this program of toe-tapping, delightful musical treasures including such iconic Shaw classics as Stardust, Frenesi and - of course - Begin the Beguine. Subscriptions on sale now - only available by phone 732-528-9211 or in person. In July 1938, clarinetist Artie Shaw - still living in the shadow of his archrival, Benny Goodman - took his swing orchestra into the studio and recorded a little-known Cole Porter song called "Begin the Beguine". Within weeks after the release of that record the following month, Artie Shaw was a household name. 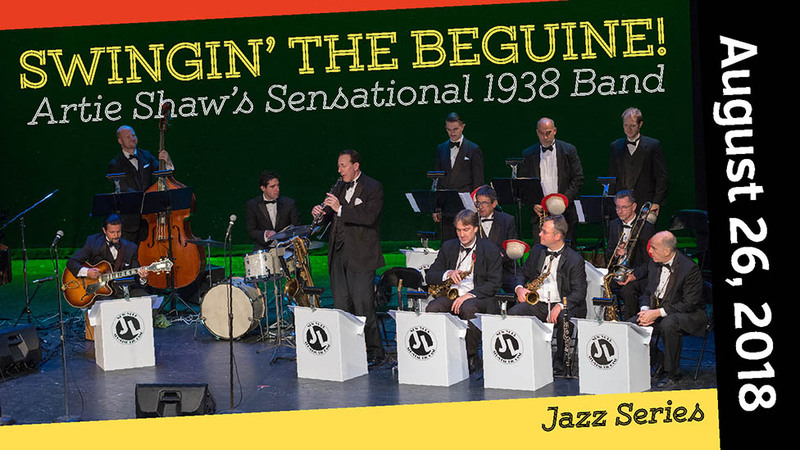 "Begin the Beguine" propelled Shaw not only to the top of the hit parade, but earned him the award for Best Swing Band in DownBeat Magazine's Reader's Poll that year, wresting the crown from the undefeated Goodman. Join poll-winning clarinetist Dan Levinson and James Langton's New York All-Star Big Band for an 80th anniversary celebration of Shaw's rise to musical super-stardom. In addition to such iconic Shaw classics as "Stardust", "Frenesi" and of course "Begin the Beguine", you'll hear some extraordinary material recently unearthed from the Artie Shaw archives that was never commercially recorded during his career, including songs originally performed by Billie Holiday during her brief tenure with his band. Don't miss this program of toe-tapping, delightful musical treasures! Jazz Series sponsored by Pamela & Raymond Brunt.